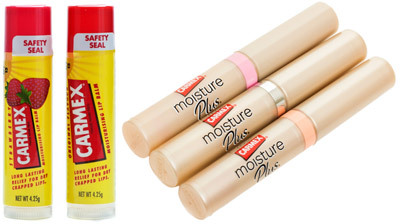 Carmex® lip balm is the ultimate when it comes to 'priming" your lips this season! Not only does your original Carmex ClickStick™ with SPF 15 protect against harmful UV rays, it also acts as a perfect base coat, awaiting a topping of your fave on-trend lipstick! Or for an added hint of summertime sweetness, why not go for a nurturing base coat of Strawberry Carmex lip balm Click Stick™ also with protective SPF 15. With its burst of strawberry flavour, this lil darling will get you in the mood for summertime fun... immediately! Those with ravaged lips (who have you been kissing, girl?) might try the super-enriching Carmex Moisture Plus in Clear Satin Gloss with SPF 15. With its sleek applicator and slant tip; apply this little beauty as a base coat to enhance your summer lipstick selections! If it's summer sophistication and simplicity you are after, then the range of tinted Carmex Moisture Plus with SPF 15 is ideal for you! The beautiful benefit of the tinted Moisture Plus range is that it moisturises and cares for your lips, whilst lending an elegant tint. Carmex Moisture Plus in Sheer Pink Tint, with the moisturising goodness of Shea Butter, Vitamin E and Aloe, as well as a protective SPF 15, is a fun and flirty lip stain! Try it immediately. Whilst the NEW Carmex Moisture Plus in Sheer Peach Tint with SPF 15 will brighten your summer smile, with its elegant tint and tone, subtly reflecting the new strong pink coral shades this summer. Carmex® lip balm is available from leading pharmacies, Chemist Warehouse, Priceline, selected Woolworths & Safeway supermarkets and selected Coles supermarkets. Please note Carmex products are NOT tested on animals and are preservative free.